It’s getting flippin’ cold and, since I’m not a great fan of the chill, I’m holed up in my studio. Things seem to be bursting forth in the garden all out of sync. Daffs before Snowdrops – what on earth is going on? At this time of year I get a bit manic trying to paint anything and everything…….not enough time. Also, I’m busy trying to get two collections together eeek! One for the Affordable Art Fair, Battersea in March (c/o John Noott Gallery) and one for little old me to take to the Surrey Contemporary Art Fair in ………….yep, March. So much for planning things out. Anyway, it’ll all come out in the wash as my ole Granny used to say. 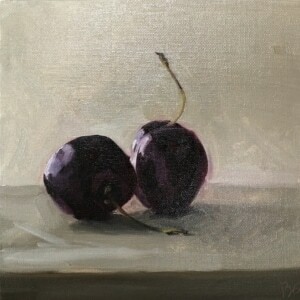 I bought some cherries to include in a couple of large paintings so did this study beforehand to get me in the mood. I have to say, it’s taken a while to get my mojo back after the Christmas break but think I’m getting there finally – fair leapt out of bed this morning! Subscribe to receive my paintings in your inbox. Your privacy will always be important to me and I will not share your details with any third party. If you no longer wish to receive updates, please use the unsubscribe button and thanks for following me. Images are the property of the artist under copyright.